This what I have in my pocket today, Kaweco Brass Sport 0.7mm. They are nice for sure and for what you are getting...probably the best buy out there today! Very nice, enjoy! I wouldn’t mind getting a .7mm when I see one in stock. Did the 5.6mm graphite finally make it off that slow boat from China??? Here is another rubber cushion mechanical pencil. This one is a Papermate Comfortmate ultra in 0.7mm. I placed it next to the Pilot G-2 mechanical pencil for comparison. If you work outside these are the go-to pencils that will work pretty good and stay in your hand. Picked up a Kaweco Sketch Up 5.6mm clutch pencil today. Solid quality and nice to write with. Thanks Poncho. Something different for sure. I'm just "rediscovering" pencils. I used the Pentel P200 series, in 0.5, 0.7 and 0.9mm for many years, as I used to be a mechanical draftsman. I never used them for writing with though, as they were always loaded with film lead. I've also got several cheapo ones, the single use chuck away type (no idea why, I don't remember buying them), but never write with those either. I just got too accustomed to "draw with a pencil, write with a pen". I've decided that I really ought to start using them more, so I've ordered myself a replacement P207, as my last one broke, but I still have a load of lead left (only the second P200 breakage in nearly 30 years. Not bad at all for such a cheap workhorse). @ Max, great looking pencil. I enjoy writing with a pencil just as much a pen. I like to take notes in pencil actually. I also jot measurements in pencil. Thanks AW, Aloha. It is a real little gem. The thicker lead is much stronger. (I stopped using the smaller clutch pencils because I was constantly snapping tips). My current favorite is the Rotring 800. 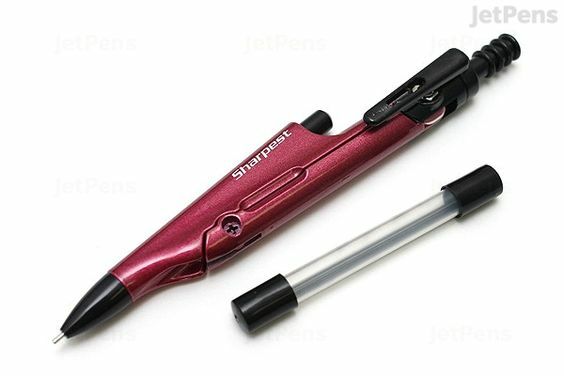 Feels solid, the retractable tip is pocket friendly and the twisting mechanism is fun to play with. And, it reminds me of engineering schools and doing technical drawings by hand. Doesn’t get much better than that italophil. a super cheap mechanical pencil that turns into a compass..yes plz. The engineer in you is right!